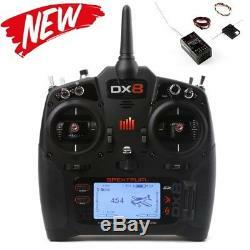 Spektrum SPM8015 DX8 8-Channel DSMX Transmitter Gen 2 with AR8010T Mode 2. Brand New in Factory Packaging. In Stock Ships within 24hrs. 8-CHANNELS AND SO MUCH MORE. Like its groundbreaking predecessor, the DX8 G2 gives pilots a powerful combination of features and capabilities no other 8-channel can match. And for a lot less than you might think, too. INCLUDES AR8010T INTEGRATED TELEMETRY RECEIVER. Included with this SpektrumT DX8 Gen 2 transmitter is the class-leading AR8010T 8-channel DSMX® receiver with integrated telemetry. Surprisingly compact and lightweight, the AR8010T provides vital flight-log data and receiver battery voltage telemetry right out of the box. Plus, an array of built-in telemetry ports makes adding, even more, telemetry data to your system easy. You'll find it compatible with a wide assortment of available Spektrum sensors such as those for flight-battery current, GPS, airspeed and much more. The AR8010T receiver also features an integrated bind-button making the need for a bind plug obsolete and the binding process simpler than ever. The DX8 lets you keep tabs on important functions without ever taking your eyes off what you're flying. You can program voice alerts to call out what flight mode you've chosen or report telemetry information on demand. If an alarm goes off, you won't have to look at the transmitter display to see what's happening. The DX8 can tell you. This exclusive Spetkrum technology gives DX8 users the ability to wirelessly link up with other Spektrum transmitters and specially-equipped Spektrum FPV headsets. Once bound to another transmitter or component, ModelMatchT technology will allow the DX8 to re-link without having to go through the bind process again. With Wireless Trainer Link, you could. Wirelessly'buddy box' with another DSMX®/DSM2® transmitter when teaching someone to fly. Assign gimbal functions to a 2nd'camera' transmitter when flying a camera drone so you can focus on avoiding obstacles and maintaining visual contact while someone else lines up the shot. Link with specially-equipped Spektrum FPV headsets to wirelessly control head tracking and remotely change video frequencies. The enormous capacity of the DX8's on-board memory means you will rarely, if ever, need to juggle models between transmitter memory and your SD card. The model memory menu is easier to navigate too. Only memory slots with model settings saved to them will appear. You won't have to scroll through empty slots or move models around if one is deleted. Because the DX8 uses the same AirWareT software as many other Spektrum transmitters, you can share model setups across platforms with almost any Spektrum pilot. Fly Smarter with Built-in Telemetry. The built-in telemetry feature gives you real-time information on things like your model's battery voltage, signal quality, engine or motor temperature, airspeed, altitude and more. Using the voice alert system, you can program the DX8 to tell you when specific telemetry values reach or exceed limits you define. You can also have it call out a sequence of telemetry values on demand with the flip of a switch. If you want to review telemetry after a flight, the DX8 can be set up to record the data to its SD card. You can return any item in Brand New/unopened condition (within 14 days). The item "New Spektrum DX8 8CH Radio w AR8010T Receiver" is in sale since Tuesday, September 12, 2017. This item is in the category "Toys & Hobbies\Radio Control & Control Line\RC Model Vehicle Parts & Accs\Control, Radio & Electronics\Receivers & Transmitters".